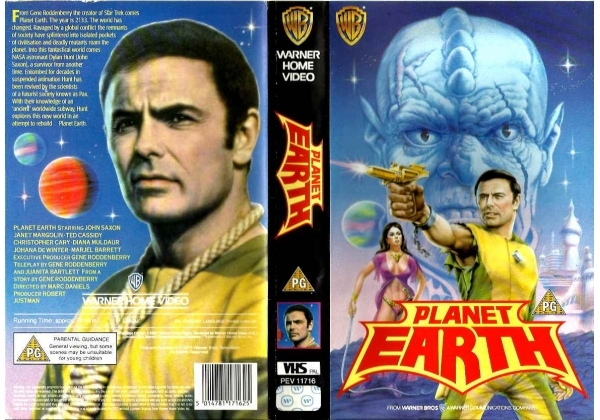 From Gene Roddenberry the creator of Star Trek comes Planet Earth. The year is 2133. The world has changed. Ravaged by a global conflict the remnants of society have splintered into isolated pockets of civilization and deadly mutants roam the planet. Into this fantastical world comes NASA astronaut Dylan Hunt (John Saxon), a survivor from another time. Entombed for decades in suspended animation Hunt has been revived by the scientists of a futurist society known as Pax. With their knowledge of an 'ancient' worldwide subway, Hunt explores this new world in an attempt to rebuild...Planet Earth. Or find "Planet Earth" on VHS and DVD / BluRay at Amazon.